Libraries NI launched the programmes for Two Cities, One Book in Belfast City Hall on Tuesday 2nd March. The launched was attended by the Northern Ireland Minister for Culture, Arts and Leisure Carál Ní Chuilín. A full programme of events will take place during April which includes a bus trip from Belfast to visit the Proclaiming A Republic exhibition in the National Museum of Ireland. 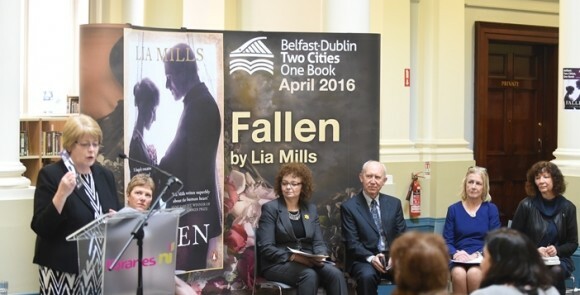 Pictured at the launch are Irene Knox Libraries NI Chief Executive, Lucy Finney Libraries NI; Minister for Culture, Arts and Leisure Carál Ní Chuilín; Professor Bernard Cullen Chairperson of the NILA Board; Margaret Hayes Dublin City Librarian and Lia Mills author of Fallen.